The second last GP of the 2005 season will be held at the Suzuka circuit in Japan (the final round is in China). With the world championship won by Renault’s Fernando Alonso (or if you are a McLaren fan, lost by Kimi Raikkonen), the race is now on for the Constructor’s Championship. The results from Brazil, with McLaren’s 1-2 puts them very narrowly ahead of Renault, with Fisichella having another of his ‘unlucky’ races (to make it about the 10th this year)! Having not gained the Driver’s title, McLaren’s Ron Dennis will be out for revenge. Ferrari looks as if it is having a small resurgence, but they are still obviously being let down by the Bridgestone tyres, and I noted that Ferrari has been re-testing 2004 tyres with a view to using them for this meeting, instead of the current 2005 ones. has not had the best of years, he is a very cunning old fox, and I personally doubt if the divorce from BMW will have given him many sleepless nights. BAR’s Japanese driver, Takuma Sato will be having his last home GP in a BAR, having been replaced at BAR by Ferrari driver Rooby Baby Barichello. Sato thought he would retain the seat when Button moved on, but then Jensen bought himself out of his contract (somewhere between 10-20 million dollars, I believe) and is staying. Sato has turned down the offer of a testing role. Despite his acknowledged speed, Sato is still too much “on and off” in more ways than one. I cannot see him getting a decent seat anywhere in the current grid line-ups. With this being the annual rumour season, who will partner Webber at Williams? 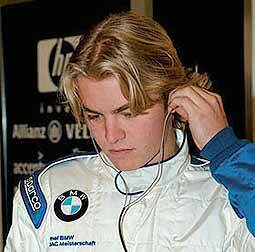 Put your money on ex-world champ Keke Rosberg’s son Nico. This young man has been doing some F1 testing for Williams this year and has just won the GP2 single-seater racing championship for 2005. He is quick, level headed and deserves the seat. See if I’m right. The race starts at (I think) at 12.30 p.m. our time, but please check with your TV feed, as I don’t want to be blamed for your missing it! I will be watching from my favourite perch in Jameson’s Irish Pub, Soi AR, next to Nova Park. Join me for lunch! Japan wanted a Grand Prix as F1 had an enormous following in that country, and there were specialist manufacturers and automakers who were interested in being part of the world F1 scene, however nobody wanted to race at Fuji. 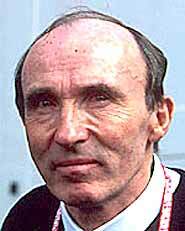 The answer was Suzuka, which had been designed by John Hugenholtz as a test track for Honda. Because it had been built as a test track, it had a wide range of corners over its 5.8 km length and it also had a flyover, a unique feature to Grand Prix circuits, and in fact for most circuits. 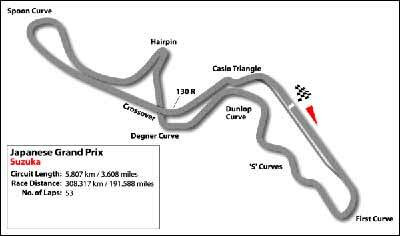 The only other one I know of is the Oran Park GP (long) circuit outside Sydney, Australia. Suzuka was first used for a World Championship race in 1987 and has ever since hosted the Japanese Grand Prix. It has frequently been the championship decider, such as in 1989 when Senna came together with Prost with seven laps to go but the title went to Prost when Senna was disqualified for being push started, or in 1990 when again Senna rammed Prost out of the race at very high speed on the first corner, but this meant that the title went to Senna. Japan invented kamikaze remember (and I don’t mean the cocktail), which Senna had learned very well. It is also good for some people to remember that Michael Schumacher was not the first to work out that by rivals retiring he could be left with the title, and thereby helping them into the shrubbery when required! A1 GP also this weekend! This week’s event coming from Germany, the Eurospeedway, a track of which I am not familiar. Last week, I asked what model BMW used its rear muffler (silencer) as an aerofoil? It was the very radical BMW Z1. Built in 1988, it had doors that dropped down into the high sills, like the window glass in a standard door. They only built 8,093 of them. So to this week. So to this week and something just a little different and also a little radical. Cars that fly, a common enough concept in science-fiction books and even featured in the cartoon TV series called “The Jetsons” in 1962. However, the auto makers was already thinking about flying cars in 1935 when the U.S. Bureau of Commerce’s Experimental Division Section awarded a contract to a manufacturer to build one. The car had a single propeller and rotor blades for flight. The gear could be folded back over the fuselage to accommodate ground movement. Two passengers could sit side by side, and there was a small baggage storage area behind the seats. For road use, the 90 bhp engine was connected to the tail wheel by a shaft that was put in gear when the propeller was disengaged. Testing began in 1936 and continued until the company dissolved in the mid-1960s. The question is then, what was the name of this flying car? What did we learn from the inaugural A1GP? On the same day, there was the telecast from the UK of the first A1GP meeting at Brands Hatch. A bunch of us descended on Jameson’s at 6.30 p.m. as the main race was supposed to be 12.30 p.m. UK time. Instead we were subjected to endless qualifying heats and then a 15 lap sprint to give positions for the main event. The telecast then continued with rally news, and finally at 9 p.m. we got the main race. The race had plenty of action, as the cars move around a lot, with plenty of oversteer. There is apparently a magic ‘push to pass’ button that the driver can use eight times during the race, but there was no explanation of how it worked. However, the telecast was woeful! I have seen better amateur handi-cams at a club meeting. Exceptionally poor quality. With all the money that has been spent on getting the series up and running, the organizers forgot that the majority of the audience are not at the meeting. They are people like us watching the flickering screen. Provided that they get a decent standard of telecast, A1GP has much more going for it than the current F1, but it will need professional motorsports TV editors and cameramen. If you get ABC Asia-Pacific, tune in on Sunday October 9 for the 1000 km race around the Bathurst road circuit. The technology for in-car camera shots was developed in Australia just for this race and is licensed for use throughout the world these days (except A1GP it seems). The race will take around 6 hours and (I think) will start at 7 a.m. our time. The first corner is incredible, with 60 V8’s funneling down into a sharp 90 degree left-hander. It is a real driver’s circuit, and many international; ‘big names’ have been humbled by it. I have raced there twice, and Bathurst remains one of the high spots in my motor racing career. The long downhill Conrod Straight was named for the number of conrods that were tossed out of engines at maximum revs, which after getting airborn on the second hump, were now over-revving. What did we learn from the Brazilian Grand Prix? Well, obviously the first thing we learned was that we have a new World Champion in Spaniard Fernando Alonso, driving a Renault made in England, with an engine made in France. Alonso is the first Spanish champion, and also the youngest champion in history at 24 years of age. He kept his head together all season and deserves his championship, though if the McLaren Mercedes had been more reliable, Raikkonen would have got the laurel wreath. Another record was made in Brazil, as this was the first time in 27 years that Williams have lost both cars on the first lap. Sir Frank would not have been pleased. However, for once, it wasn’t Mark Webber at fault, but Jungle Boy Pizzonia. Do not expect to see Pizzonia in the second seat at Williams for 2006. As for the race itself, it was deadly boring. Did anybody see any passing action after lap 1? If there was, I must have fallen asleep and missed it.